If you love college basketball and college basketball betting, then you should love the Atlantic 10. The variety of styles. The unique terrain in terms of home courts and locations. The traditional mid-major powers and "name" programs. And the sheer volume of teams and games makes this one of the most entertaining and potentially-profitable conferences in the country. This season will be no different. With the usual amount of turnover (heavy), the A-10 is going to have a distinctly different look and feel to it this season. And if you search through preseason magazines or online previews about this conference, you will see wild fluctuations in the predicted order of finish for this league. But, again, that's part of what makes the conference so interesting to fans and so fertile to bettors. It's really difficult to lose a player like Peyton Aldridge, one of the most productive college players in the country over the last three years, and maintain a position as conference favorite. 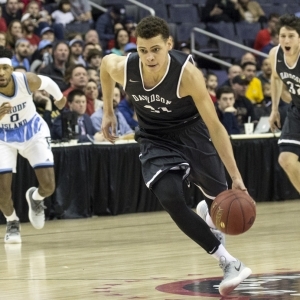 That's what Davidson is doing this year because of the emergence of Kellan Grady, a 6-5 guard that averaged 18 points per game as a freshman last year. Grady is going to get a lot more attention this season without Aldridge. Scoring won't be a problem for the Wildcats. Defense and rebounding will, as usual. I'm not as high on this team as a lot of prognosticators. This team is young. And you don't just lose a guy like Aldridge and not have some kind of drop off. Before his star-crossed turn at Oklahoma State, Travis Ford had made a decent name for himself with some explosive A-10 teams at Massachusetts. He's looking for history to repeat itself, this time in St. Louis. Ford has collected a load of transfers and now boasts one of the most athletic and talented teams in the conference. The Billikens have four starters back from last season. Yet the buzz around this team is mainly because of freshman Carte'Are Gordon and transfers Tramaine Isabelle and Dion Wiley. This roster doesn't have a weakness. They have scoring, size, defenders, experience and athleticism. The only question is if Ford can strike the right cord when it comes to chemistry and whether or not these guys can all learn to play with one another. If they do, watch out. Dave Paulsen's crew is garnering a lot of hype for a team that is coming off its fourth sub-.500 season in the past five seasons. The Patriots are bringing back everyone - and I mean everyone - from last year's squad. They have a legit go-to guy in Otis Livingston III among a trio of three-year starters in the backcourt. Sophomore forwards Goanar Mar and Greg Calixte both showed a world of promise last year, with each averaging double-figures. And if this group can take care of the ball and increase its overall offensive efficiency, then they could do some major damage in the league this year. St. Joseph's was a major disappointment last season. They also lost their two best players, who combined to average 34 points per game. But this year's Hawks team could be significantly improved behind Lamarr Kimble and Taylor Funk. Phil Martelli's group is made up primarily of sophomores and juniors, each of whom have logged significant minutes over the last two years. We could see the payoff this year after last season's fourth-place league finish. It was a real nice run for a Rams team that has won a game in each of the last two NCAA Tournaments. However, this is very clearly a rebuilding season in Kingston and the beginning of a new era of URI hoops. Danny Hurley took the job at Connecticut and left former assistant David Cox behind to pick up the pieces. The Rams lost four of their five starters from last year's squad, which was one of the most experienced in the country. This year's team doesn't have nearly the same level of leadership or experience. And the Rams' fall back to the A-10 pack should be swift and severe. St. Bonaventure - The Bonnies bid adieu to one of the nation's best backcourts, losing both Jaylen Adams and Matt Mobley (and their combined 37.2 points per game) to graduation. Super-senior Courtney Stockard and forward LaDarien Griffin are the only two seasoned pieces remaining on the roster. Mark Schmidt has been an excellent coach at St. Bonaventure. And Olean is one of the toughest places in the league for visiting teams to steal a win. This team is still starting over this year, though, and there's no way they will match last year's 26 wins. VCU - Mike Rhoades had a generally unimpressive debut on the VCU sideline, winning just 18 games and struggling to reach .500 in A-10 play. And as I look at this year's roster, I don't see the same level of depth and aggressiveness that I have from previous VCU rosters. This Rams team is a little soft, as indicated by their No. 243rd-ranked defense last season. Rhoades won't get this program back to the lofty heights it had reached in the past if he can't regain that edge for his Rams. Richmond - Chris Mooney is one of the few coaches in the country that still runs the Princeton offense. And his Spiders ran it well enough last season to claw their way to 9-9 in league play despite finishing just 12-20 overall on the season. Mooney lost his two best guards. But sophomore stretch-four Grant Golden looks like he could become one of the league's best players. And a backcourt of Jacob Gilyard and Nick Sherod is nothing to sneeze at. The Spiders will be good for an upset or two in league play and will be a tough team to bet on or against. LaSalle - I have no idea why LaSalle remains the only Philadelphia-area basketball program that can't get its act together. But here we are. They have yet another new coach (Ashley Howard, formerly of Villanova) and are heading in another new direction. Howard will have to begin his reconstruction without three starters from last year, including 21-point scorer B.J. Johnson. I think Howard wants to clear the decks and start rebuilding this program from scratch. That means things will get worse before they get better. However, they've been so bad for so long here that I doubt anyone will notice. Dayton - Anthony Grant was a curious hire in Dayton because his trapping, pressing, up-tempo style is such a sea change from what the two previous coaches, Brian Gregory and Archie Miller, did so successfully. As such, last season was a predictable disaster for the Flyers. I don't know that it will be much better this time around. Yes, Grant has four starters back. But this is still one of the A-10's younger teams, and they still have a lot more questions than answers. George Washington - I am not surprised at all that Yuta Watanabe has found his way into the NBA (with Memphis). He was one of the most underrated players in college basketball last year and will be impossible to replace for the Colonels. GW still hasn't recovered from the scandal that knocked out former coach Mike Lonergan. And to this point Maurice Joseph hasn't shown me anything to indicate that he can coach. I wouldn't expect a revival in Foggy Bottom this season. Fordham - I like Jeff Neubauer. He's a good coach with a solid, team-oriented system. But he's wasting his time at Fordham. I'm not sure what it is, but this program is not meant to win at the college level and they should probably consider dropping down a peg or two into a weaker conference. These guys are just awful. Duquesne - Keith Dambrot, erstwhile of Akron, did a great job coaxing a .500 season out of the Dukes last year. He'll see if he can build on that despite losing a pair of double-figure scorers from his backcourt. Keep an eye on Frankie Hughes. The Missouri transfer is a very talented player that could turn out to be a star in this league. Whether or not he, and Dambrot, will get enough help from the young post players remains to be seen. Massachusetts - If you have a guy that can score like Luwane Pipkins, then you have a chance. At least that's what UMass is hoping as it heads into Matt McCall's second season. Pipkins averaged 21.2 points per game last year and will be bolstered by sharpshooter Carl Pierre and enigmatic big man Rashaan Holloway. That's a really solid trio and should be enough to get Massachusetts into the league's top half. But if they want to be anything more than mediocre, they will need one or two players to emerge from a muddled bench.